We were back on Longs for this match and I fancied a draw on the far side, something like peg 2 again would do me but by the time I stuck my hand in the bucket there was only one ball left, a quick look revealed my home for the next six hours would be peg 29. I must admit I was a little disappointed as I’ve struggled the last few times I’ve drawn on the roadside. For company I had Glynn Wickham on peg 26 and young Reece on 31 which was also the golden peg. Rigs for the day were the usual 10 x 11 MW F1 Slim with 0.12mm bottom and size 16 808 and a 0.4 gram Malman Pencil with the same hooklength but a size 16 B911 with hair rigged band as I’d caught well on it the last time I was here when I won the silvers. Today’s groundbait was Thatchers Dark and bait was the usual micros and Bait-Tech 4mm expanders although today I also had some 6mm Marukyu JPz pellets (which I’m reviewing for Pondip) as a change bait. On the whistle I cupped in some micros at 5 metres and 10 metres angled to my right plus two balls of groundbait at the same distance, but straight out in front. I started over the longer micros line and had a couple of little 2-3oz blades so switched to the groundbait line and my first fish there was a carp which had such a round, deformed belly it looked like it had swallowed a football! I then had a decent flying skimmer around the pound mark and another carp. Back over the micros and I added a couple more little skimbobs to finish off a steady first hour. Going into the second hour I kept swapping between my two longer lines but the groundbait line was proving to be the most productive as I added another good skimmer and a lovely crucian carp. Everytime I shipped out I dripped in a few micros on the 5 metre line but I wanted to leave it as long as possible but there were already quite a few blows there which I hoped was a good sign. 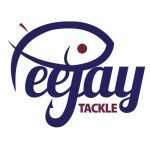 So far I’d only seen Glynn catch a few small fish, Reece looked to be struggling and when Adie walked down and said Nigel Wickham up on peg 34 hadn’t had much either, I felt I was doing okay. After two hours, the lure of the bubbles at 5 metres was too much so I fed the two longer lines again before I tried it with a hair rigged, banded 6mm pellet. I had to wait ages for a bite and then of course I missed it! 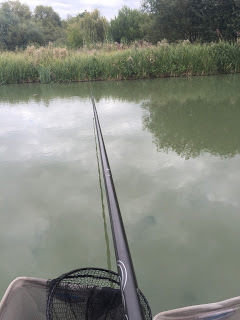 I missed the next couple as well and became rather preoccupied with trying to hit these bites, when I eventually hooked a fish, it was another crucian carp which led to me spending far too long on this line with very little return. Back out on the longer lines I added a couple more blades on expanders so tried a red JPz pellet and had a slightly better skimmer of 4-5oz straight away but it was a one off and the next few fish were all small carp on either red or green JPz’s and came from the groundbait line. I’d seen Glynn net a couple of better silvers and he was also catching quite a few small roach so I didn’t think there was much between us now, Reece was still struggling and had even tried fishing a feeder to the far bank. We were now heading into the last two hours of the match and after a steady start I had really struggled in the middle part of the match. The short line was still fizzing like crazy so I went back over it, hoping for a late run of decent skimmers. My next fish wasn’t a skimmer but a 10oz tench which was just as welcome but then a run of carp didn’t help my cause much. In amongst the carp I had my third crucian of the day but I just couldn’t catch the skimmers I needed if I was to do any good today. 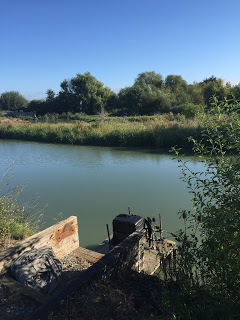 The last hour was a nightmare and I’ve had a bite every chuck but missed most of them, I did manage another little tench and a couple more carp, landing one right on the whistle. I ended with 17 silvers (2 decent skimmers, 3 crucians, 2 tench plus blades) and around 12 or 13 carp. I thought my silvers might go 4-5lb which I knew would be nowhere near enough today as you normally need around 15lb. I packed up and as we waited for the weigh in, the usual shenanigans started, Nigel Wickham was admitting to 3lb of silvers and 10lb of carp but when the scales reached him he actually weighed 9lb of silvers and nearly 30lb of carp! Reece had taken an early bath and then it was my turn, my carp went a level 26lb and I wasn’t too far out with my estimate as my silvers weighed a lowly 6lb 9oz. Glynn just pipped me for the pound when he weighed 7lb 4oz and all those little roach had made the difference. Craig S on peg 24 then went into the lead with 50lb 13oz of carp and 6lb of silvers. 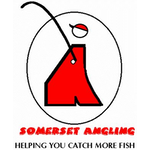 Chris M had 34lb 4oz on peg 19 and Steve H had 18lb from 17 before we got to Roger Russell on peg 14 who went into the silvers with 10lb 8oz which included a huge eel of 3lb plus that he caught on hard pellet! It was a big fish and I wish we’d weighed it on it’s own but I don’t think anybody was brave enough to try and wrestle it in the weigh sling! Rene on peg 10 went into second place with another method caught bag of carp weighing 53lb 8oz but one of his carp had pulled off a ‘Great Escape’ and jumped out of his keepnet which could prove costly! Then we got to Ray Wickham on peg 7 who didn’t moan at all (much!) 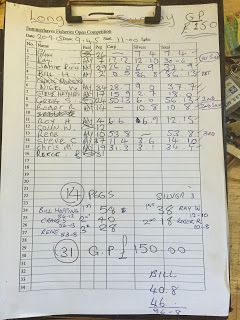 when he drew it this morning, he had a nice net of silvers to go into the lead with 12lb 10oz, Roy Hughes on peg 4 had 6lb 9oz of silvers and then Bill ‘The Paste’ Hopping stormed into the lead with another big net of carp weighing 86lb 13oz from peg 2. Last to weigh was Steve C on peg 37 and he had 11lb odd of carp and 3lb 6oz of silvers. So Bill won again and he’s certainly the man to beat at the moment.